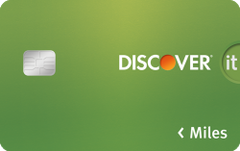 Discover Match® Discover will match all the Miles you've earned at the end of your first year, automatically. For example, if you earn 30,000 Miles, you get 60,000 Miles. That's $600 towards travel! 1.5X Earn unlimited 1.5x Miles for every dollar spent on all purchases all with no annual fee. No cap for first year-end match. The more you spend, the more your first year-end bonus. So, if you earn 30,000 miles throughout the year, that becomes 60,000 miles at the end of your first year. See more of the best travel credit cards. Our take: The Discover it® Miles card offers a range of high-end travel perks and an industry-leading rewards rate for the card’s first 12 months, but the benefits drop off significantly after the first year. Ratings and reviews provided by issuer as of 2017-09-13.